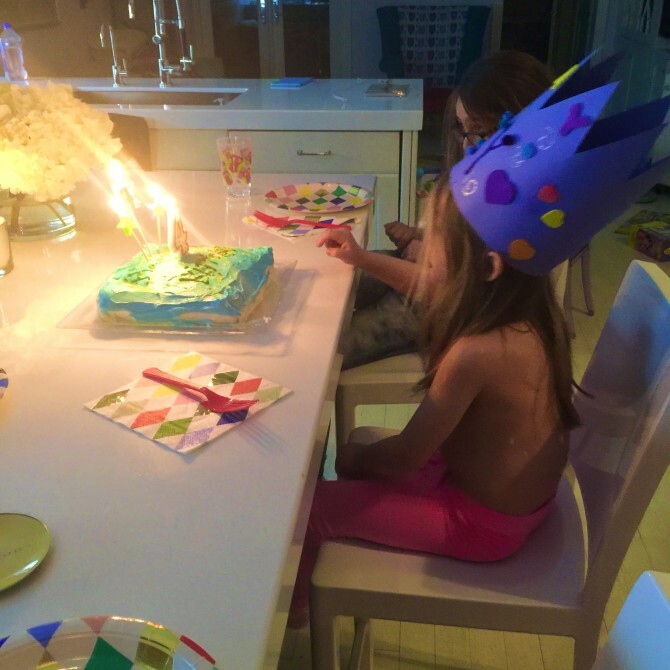 On Friday (March 6th), Little Girl turned 4. This fact felt, and feels, impossible to me. That my baby (who hates the word baby) has been around for four full years is truly difficult for me to believe. 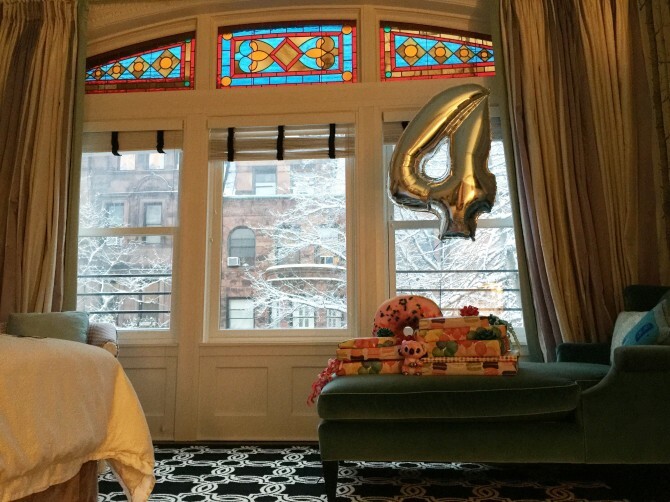 The day before her big day, I huddled on the floor of our bedroom and I wrapped presents. Sweet little spring clothes and Beanie Boos and a couple new puzzles. The paper was happy and colorful and I attached ribbons and bought an enormous silver four balloon and I set it all up and I stood back and stared at it and I felt flooded with emotion. I am prepared. I am not prepared. I can't explain how excited she was for this birthday. Husband has a theory that she's so excited to get older because she wants to catch up to her big sisters. He explained to her that they would always be older and she didn't seem to like this. Anyway, she came bounding down the stairs in her pajamas on Friday, her doting big sisters right behind her. 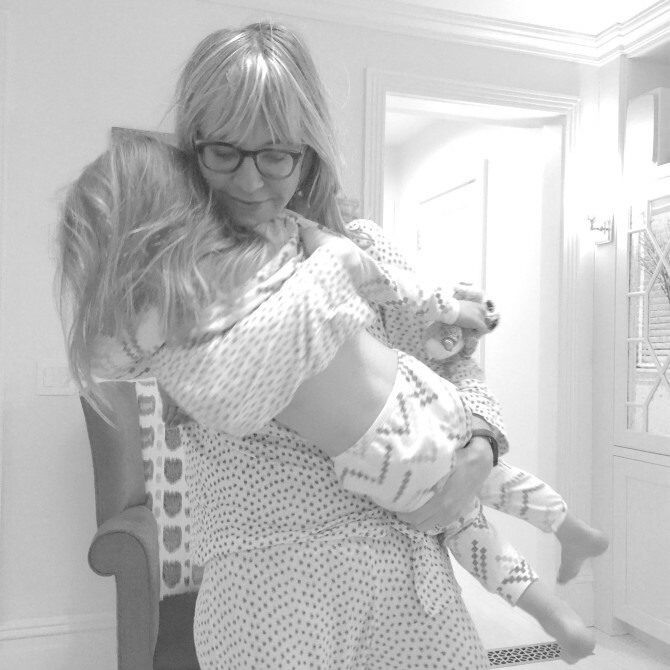 I had been up writing and I scooped her up in the most gigantic hug. She opened her gifts and requested a jelly sandwich from Daddy. The big girls had no school because of parent-teacher conferences so we all went into her classroom to celebrate. Her teachers had made her the most fantastic blue construction paper crown with her name on it and we read a storybook and sang to her and watched as all the kids gobbled up their tiny vanilla cupcakes. Thank you for being born! her wonderful teacher said. After school, we Rowley girls had a delicious milkshake lunch at our fave neighborhood spot Sugar & Plumm and then we did the unthinkable: we braved Build-A-Bear in Times Square as Friday rush hour approached. The girls squealed and skipped around the store and picked the animals they'd make. Little Girl made a pink camouflage bear that sang happy birthday and she dressed it in a pink satin dress. She named it Beary-Boo. Home again, we had Italian takeout with Daddy and everything began to fall apart a bit, as it tends to do at 6pm on a Friday. There were tears and boycotted-spaghetti and exasperated grown-ups, but it was real and full of family and chaos and a mangled-looking blue cake and lots of love. I thought to myself: Happy birthday, sweet thing. May you remember this day. And then yesterday, Sunday, we hosted her gymnastics birthday party. She and her sisters donned their leotards and had the absolute best time. Little Girl's little girlfriends did too and it was a high-energy, beautiful blur. The kids nibbled on pizza and green Magnolia cupcakes and then had a bubble dance party set to Gangnam Style, the song my precious babe chose. They all got happy birthday medals before saying goodbye. It was a good party, but what made me happiest was that my girl enjoyed herself so. She literally never stopped moving. She ran around and tumbled and jumped with arms up into a giant foam pit and swung confidently from the bars as we all watched. And today, Monday, I took her to school. We were running late, but we stopped for Munchkins anyway. She was sad that Grammy and Dad-Dad were leaving town and I knew the sugar would cheer her up. And it did. As did the endless back-and-forth of potty words we indulged in. Oh the laughter. My baby is four. It's hard to fathom, but I've decided I'm okay with this. I must be. Time will continue to pass, to startle me with its speed, but I will smile and hang on to these moments big and small, serious and silly, that are everything. Happy birthday, my girl. I love you to itty-bitty pieces of sky.